HK50 Analysis: Hong Kong’s trade deficit widened. Will the HK50 continue declining? Hong Kong’s trade deficit widened in November. Will the HK50 continue declining? Recent Chinese economic data were negative: manufacturing slowed in China in December while trade deficit widened in Hong Kong in November. Markit reported that Caixin Manufacturing PMI declined more than expected in December, indicating contraction in China’s manufacturing sector. And Census and Statistics Department of Hong Kong data showed trade deficit widened to HKD 45.0 billion in November of 2018 from HKD 39.7 billion in the same month a year earlier. The slowing of activities in manufacturing sector is being attributed to deteriorated US-China trade relations, though President Trump tweeted over the weekend about “big progress” in a telephone discussion about trade with Chinese leader Xi Jinping. Weak economic data are bearish for HK50. On the daily timeframe the HK50: D1 is falling after retracing to three-month high in the end of September. The Stochastic oscillator is falling but has not breached into oversold zone yet. 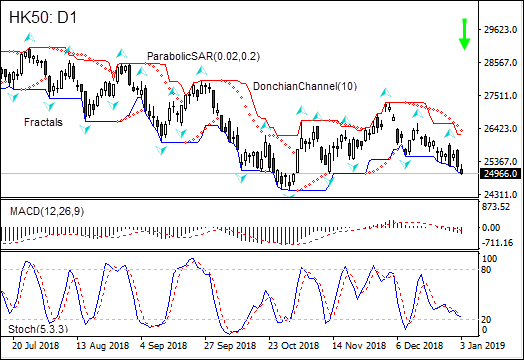 We believe the bearish momentum will continue after the price breaches below lower boundary of Donchian channel at 24926.5. This level can be used as an entry point for placing a pending order to sell. The stop loss can be placed above the last fractal high at 25958.0. After placing the order, the stop loss is to be moved every day to the next fractal high, following Parabolic signals. Thus, we are changing the expected profit/loss ratio to the breakeven point. If the price meets the stop loss level (25958.0) without reaching the order (24926.5), we recommend cancelling the order: the market has undergone internal changes which were not taken into account.